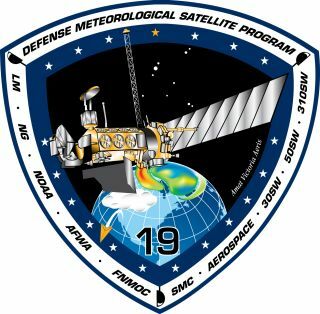 The Defense Meteorological Satellite Program Flight 19 (DMSP 19) satellite will provide the military with visible and infrared cloud pictures, and will collect data on precipitation, surface temperatures, soil moisture and space weather. A $518 million military weather satellite that has been waiting 15 years to shine will be launched into orbit Thursday atop an Atlas 5 rocket from the western spaceport in California. Liftoff of the Defense Meteorological Satellite Program Flight 19 spacecraft is planned for 7:46 a.m. local time (10:46 a.m. EDT; 1446 GMT) at the opening of a 10-minute launch window at Vandenberg Air Force Base. Outfitted with a suite of seven sensors, DMSP provides the military with visible and infrared cloud pictures, measures precipitation, surface temperatures and soil moisture, and collects space weather data. Until now, when the Lockheed Martin-built satellite is finally needed in space. "The program was supposed to have flown out years ago. Success, though, believe it or not, was the cause of the delay. This last block of satellites have lasted significantly longer than anyone projected. So when this satellite was originally built the plan was for it to be launched shortly after it was finished," said Lt. Col. James Bodnar, 4th Space Launch Squadron commander at Vandenberg. "This satellite was built in the mid 90s. There's components that were made as early as 1993. It was turned over to the Air Force as finished in 1998 and put into long-term storage for 10 years. "The satellite itself was originally built in (East Windsor,) New Jersey. When it was finished it was shipped to California and put into storage in Sunnyvale. In 2008, it was brought out of storage." Along the way it underwent two lifetime extension efforts to boost the in-space life expectancy, upgraded with star trackers and a digital gyroscope for navigation and replacement of materials and lubricants that had degraded over time. And there has been testing -- lots of testing -- on Flight 19. "We have had to go through and make sure the satellite and sensors all work as they were intended. We did go through a testing regime to make sure the results that we got several years ago when the satellite was delivered to the Air Force still worked," said Col. Scott Larrimore, the Air Force weather program director. "It was shipped to Vandenberg on Aug. 1, 2013 by C-17 aircraft and went to our historic payload processing facility that was built around processing DMSP satellites, Building 1559," Bodnar said. Final sensor installations, more testing and encapsulation of the 2,700-pound satellite occurred at Vandenberg before the craft took a 6-mile, 8-hour journey to the launch pad on March 19. There, it was hoisted into the gantry and mated to its booster rocket at long last. "I've been in this business a while and this is a rare and blessed problem to have in that the satellites (in space) have continued capabilities significantly longer than originally designed, saving the government large amounts of money and time in the form of development follow-on blocks of satellites," Bodnar said. "I think we need to highlight the reason behind that and that's been the fantastic longevity of each of the satellites that have been launched over the precious years." One satellite, for instance, was launched in 1995 and remains alive today. Flight 19 will be 7th satellite in the operating DMSP constellation. "The satellite we are launching could provide weather data as late as 2020," Bodnar said. DMSP 19 is the fifth satellite of its particular breed to launch and is part of Lockheed Martin's legacy that has produced nearly 50 satellites throughout the program's 52-year history. "The DMSP program is the longest running satellite production program in the world. There's been no other satellite program that has lasted as long as the DMSP program," Bodnar said. "We look forward to another successful launch in extending this mission into the next decade," Larrimore said. Copyright 2013 SpaceflightNow.com, all rights reserved.